It must be the year of the gold leaf frame for me. I'm at the bank waiting to get through the drive thru window and I "spy" what looks like a large, gold leaf, oval frame on the grassy median that divides the bank from the shopping center next store. 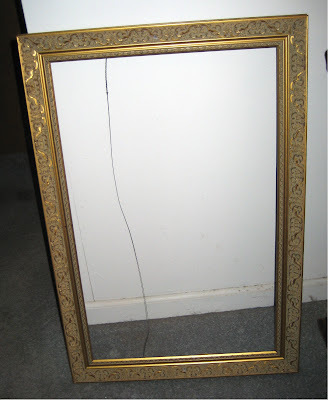 I finish my banking and pull over to the median and sure enough, it is a huge gold framed mirror. When I go to pick it up, I realize it is attached to a medicine cabinet. Must have fallen of somebody's moving truck and lucky me, another found treasure for the store. It was huge, heavy and in excellent condition but covered in bright yellow pollen that is everywhere this time of year. Kota was not happy being crowded out of the back seat though. Swung by Einsteins Bagels and bought him a doggie bagel as a bribe. Everybody is happy! Hit one of my favorite haunts for treasure. It was pouring in Atlanta (all weekend and today it continues) so the usual row of tables was not set up. Not a lot of pickings but still found some great little items. Found a neat 1930-40s wooden ironing board. Used to find these all over the midwest, not so much in Atlanta. They make such fun sofa tables or entry way displays. Also a pretty (not old) stained glass window piece. Pretty floral scene created with lovely cathedral glass and Tiffany's copper foiling technique. Another huge antique gold leaf frame. You can see the gold leaf frame I "found in a shop's trash" last weekend behind it. Im selling these as fast as I can get them in my booths. This pretty little chocolate pot and three demitaisse cups. One cup is in perfect condition, the other two have issues and the pot is missing its lid, but it is such a pretty thing. Made in Germany. A nifty 1940s bakelite frame and crocheted handbag, a sweet little "Sweet Lavender" transferware urn and a marvelous, Last Rites Victorian crucifix. This one even has the skull and crossbones at the bottom signifying its primarily use for the sacrament, Extreme Unction. Closer photo of the skull and crossbones. You know me and Early American Pattern Glass (EAPG)...I'm crazy about it. Sweet little creamer and wonderful "picket fence or London (its formal pattern name) compote. I'm keeping the compote for my personal collection. I love to fill pattern glass with antique Christmas balls and garland each December or I fill them all up with pretty foiled Christmas candies. My breakfront looks like a candy store when I do this...something my mother used to do each December. It looked like an old fashioned candy store and it is one of many fond memories my mother left me with. Couldn't pass these pretty glass bunnies up and I added easter egg candles to them for fun. Hard to find, Ronson table lighter...the Senator. Usually found in a wood base, this one has a faux crocodile pigskin wrap and is in great working condition. Circa 1954. Now, the best prize of the day. A faboosh, rolled gold Edwardian pocket watch. Case is in excellent condition and it has pretty Spencerian script initials "M.A.". Watch is a Waltham which has been overwound and is missing a crystal but a Waltham timepiece were the hallmarks of pocket watches in the 1850s. I will have a new crystal put in it and my local watchmaker repair the spring inside. I paid $30.00 for this beauty and I am anxious to see it running again. Who doesn't love flow blue? Came across this lovely souvenir plate of Boston. Rich cobalt blues and at a steal of a price to boot. Added this to my collection as well. Big, gold leaf frames are everywhere in my booth, but they sell as fast as I can bring them in. Had to take a closeup of the garden ducks, goose and chick. They make me laugh. An Iconic American actress that defines glamour Hollywood Violet eyes and looks that smolder. Swore like a sailor, knocked back her bourbon and married the men she loved. HIV/AIDs advocate for awareness and education. She, like I, believed that no one should die from loving someone. I worked from home today as I had a nasty cold. With the loud bark from Kota, I knew there was someone at the front door. Behold, the mailwoman with a package in her arms for my honey and I. What could it be, we hadn't ordered anything? Lots of Chinese characters on it and we knew it was from Alan's daughter and her husband. They moved to Shanghai late last summer and have been enjoying the country, its people, color and flavor. Marvelous treasure...A book about China, another about its textile history and an assortment of vintage Chinese pinup pictures on playing cards, note cards and a fantastic business card case. How lovely is this card case? Perfect for my blog cards that I hand out to shop owners when I ask them if I may post about their shop on my blog. My blog cards fit perfectly. Such pretty note cards of vintage Chinese pinup girls often found on calendars.All of these lovely items were wrapped up in pretty rice paper. I will repurpose the papers into other things. Now, we have a guest at our house for the next few weeks. My 5-cheese ravioli has sent her friend, Flat Stanley, to visit us. If you are not familiar with Flat Stanley, he is the brain child of, Dale Hubert, a Grade 3 teacher in London, Ontario, Canada, who began the Flat Stanley Project in 1995. He invited other teachers to take part by hosting flat visitors. It's as if the sender and the recipient have a mutual friend, and writing becomes easier and more creative for the sender. 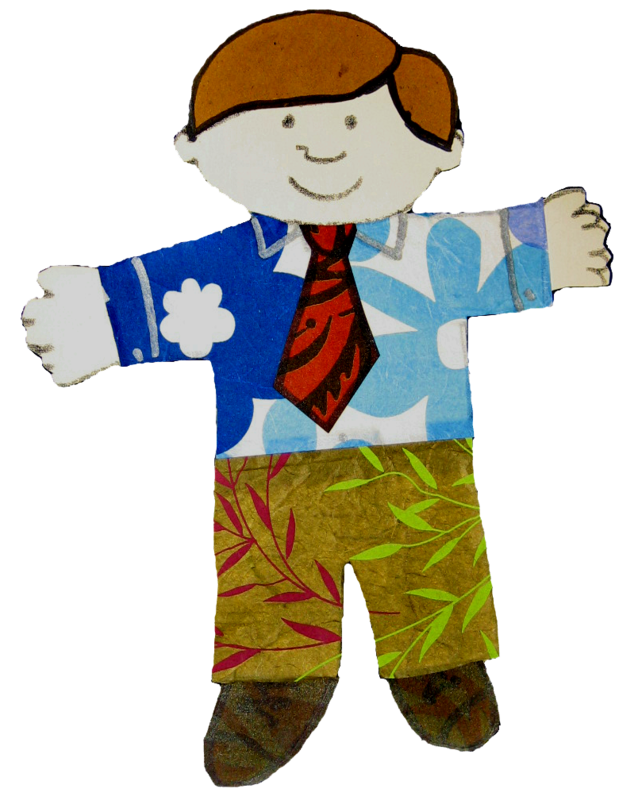 Like the traveling gnome, Flat Stanley will travel with me to different places. I'm even going to take Flat Stanley swimming. Just sent this photo to my 5-cheese ravioli as one of his first experiences. Yes, that is Flat Stanley hiding in one of the Sea Witch's bull helmet shells. What fun this silly little project is for children and their friends and family. Simple genuis from a man with a love of learning and sharing. 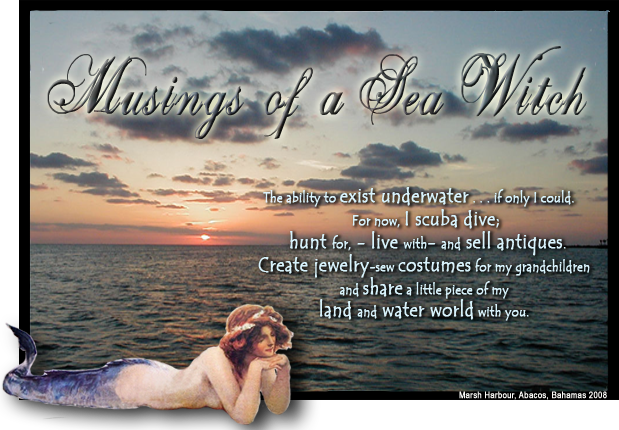 Thank you Dale Hubert and welcome, Flat Stanley to the Sea Witch's world. 76 degrees in Atlanta and it is marvelous to be outdoors. Clear blue skies, warm sunshine and setting up my booths for Easter made for a lovely Saturday. How sweet are these vintage cabbage salt and pepper shakers and perfect for an Easter table with the bunny candy dish. I brought in eight, vintage spring hats and they are throughout my main booth. This marvelous blue and white straw number looks well next to the vintage rabbit toy. I filled the huge crystal vase with faux sparrow eggs. A little girl watching me set up insisted that I add the pretty glittered egg garland. Not the minimalist look that I like, but it put a smile on her face when I took her advice so I left it. Who knows, perhaps she will become an antiques dealer when she grows up. Frames must be in my "moon" because I have found them like mad these past few weeks. Came across these lovely wooden oval frames that was deadstock from an art store that closed in the 1960s. This delightful pair of oil cloth rabbit dolls are handmade and embellished with vintage fabrics and lace. I purchased a slew of stone and bone frames from Hobby Lobby last spring. They were all on clearance and I paid about 99 cents for each. I love putting vintage photos in neat looking frames. Not only do you wind up with instant relatives, but they have a whimsical appeal to them. This vintage photo of a cat sitting in a bird birth made me laugh out loud. Cats are so funny. Late Edwardian day dress with pretty pleated panels and net lace. I filled all of the antique candlesticks with pretty Easter eggs. Following my booths redo, I took a walk to see what other dealers had brought in and as usual, I found a marvelous little transfer ware chocolate cup and saucer and spare cup in SassyTrash's booth. Pretty little things with brown transfer ware designs. Almost can't wait for the cold weather again to make some Mexican chocolate laced with cinnamon. Sigh, Miss Sassy, I could live in your booth with all of the pretty things you have to offer. I was also in Hobby Lobby picking up net fabric when I walked down this aisle to look at the beads and saw that some "joker" had rearranged these initials you could purchase. Couldn't resist snapping a pic from my iphone. Ya have to find your giggles where you can. 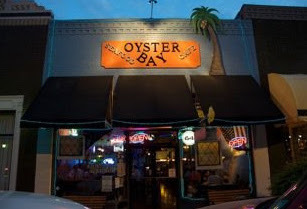 My honey and I had dinner with my sister and her friend at a great little "grouper place" in Lawrenceville. The Oyster Bay Seafood Cafe feels like you have walked into any fish house somewhere in Florida. Great food at even better prices, icy cold dark beer and excellent wait staff make this a wonderful place to go with friends and family. Following good conversation and lots of laughter, we walked out of the rear entrance when I spy a beautiful gold leaf frame in the trash can of a shop next store. Without missing a beat, I walked down the steps, picked up the frame from the trash and kept walking to my sisters car. With everyone laughing at my subtle found object, we continued to the car and I put it in the trunk. 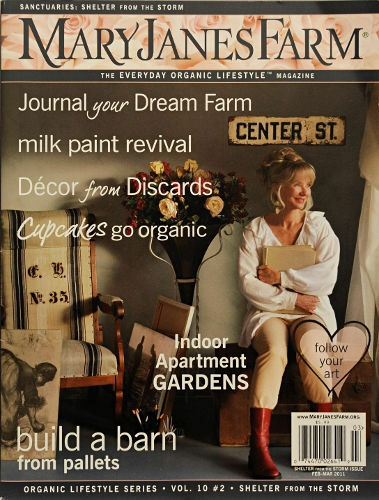 Have you ever seen this magazine, "Mary Janes Farm"? I came across it last evening in my local Kroger. 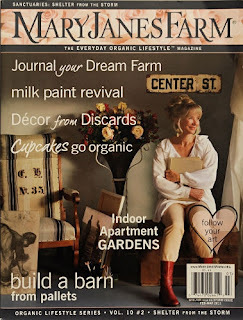 I don't usually purchase mags from the Krog as they don't have my usual selection (i.e.Somerset Studios, Interweave Knits, Spinning, Threads, Ornament, etc) but a magazine I had never seen before stood out among the slick covers in the racks. 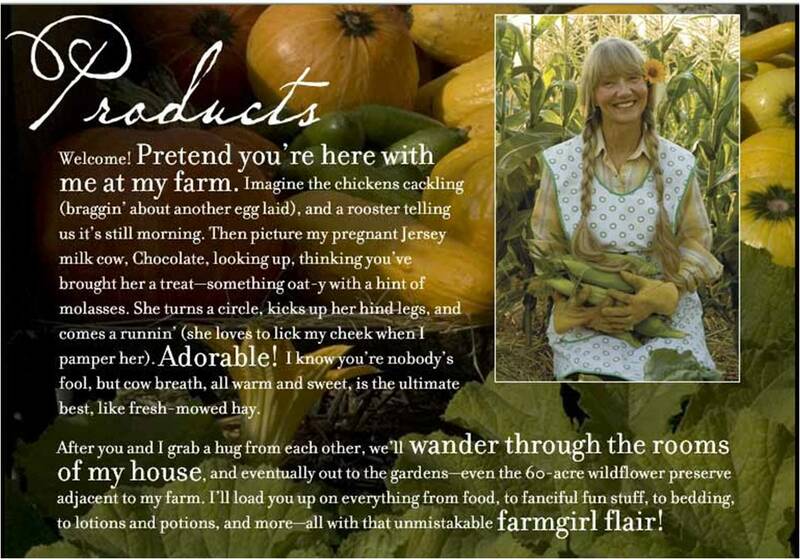 Mary Janes Farm. It was the matt finish that caught my eye first. I like this finish on a magazine's cover, always have. Somerset Studio's first ran with this look and I have always loved the look and the touch. The masthead contained the words, Sanctuaries: Shelter from the Storm. Well, they had me at Sanctuaries. I had to see what other issues were out there and discovered that Mary Jane's Farm is a broad and delightful experience. She has TV shows, chats, books and a huge website. Mary Jane herself. 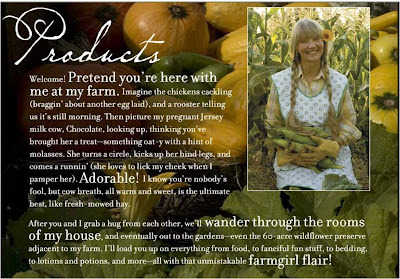 You will delight in her words and feel like you are with her as she invites you to her happy farm life that she infuses with "farmgirl flair," a generous enthusiasm for her lifestyle and just beautiful and natural things. For me, this magazine was love at first page turn. I may have been born a city girl, but I have held gypsy feet and a heart that goes with them. I am the woman who would walk through the mud and the muck to feed her children or get over the next mountain on foot if necessary. My "threads" may be worn to shreds, but I will still put together a big, sassy hat and shove a found pheasants tail feather in it for good measure before I serve you what humble fare I could put together. I have always said that I may not be pretty, but I clean up well and when you need someone to fight the good fight with and then sit next to you as we are waiting for bail, then I'm your gal. Mary Jane's Farm is my kinda gal. 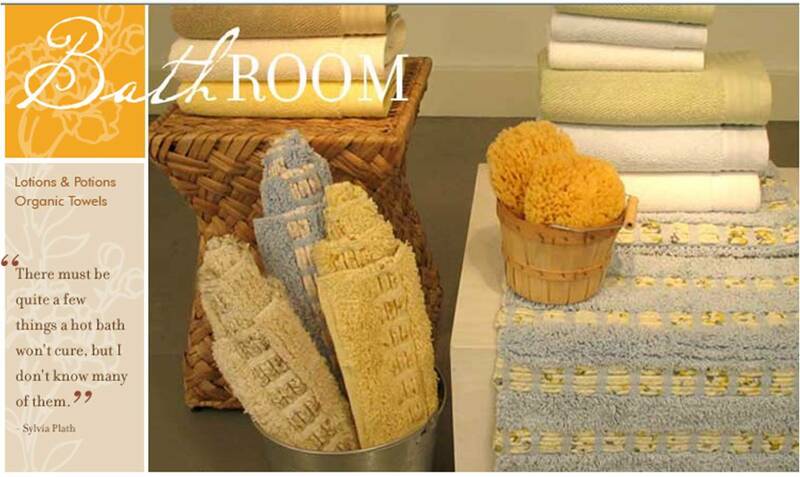 I love thirsty bath rugs and natural sponges. Mary Janes Farm has fun, kicky clothing that makes a statement without saying they are making a statement. Fun, Fun, Fun. 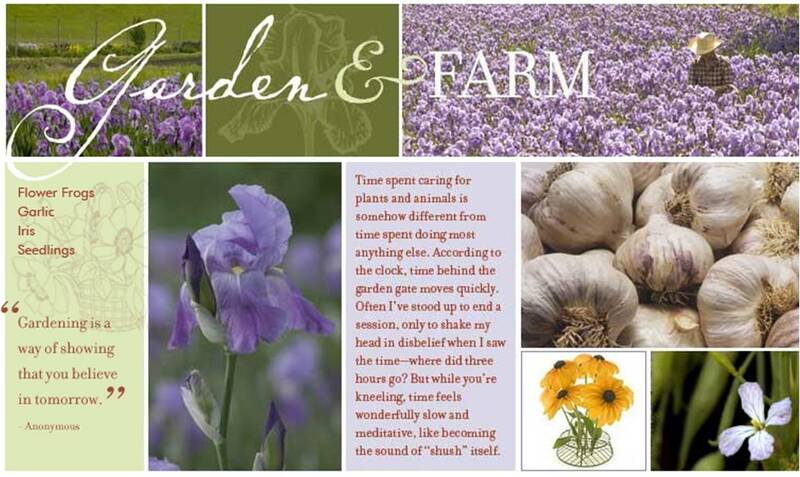 She had me at lavender and garlic. LOL Lavender is my favorite floral scent and the color is just glorious. I toss garlic into just about everything so this screen shot of her garden category utilizing the color lavender and showing the fists of garlic just made be smile. The clocks were moved ahead (for most of us) and spring was in all its glory in the south. A perfect day for me to finally make a road trip to Scott's Antique Market located south of the Atlanta airport. I have been here for 11 years and have never visited so off I went. My friend, "My Vintage Heart" has a booth there and I had to come visit it. An hour through weekend traffic and my $1.00 off parking coupon in hand, I finally make it to the North Pavilion. Busy, busy, busy. Lots of stuff located outside. Always my favorite place to find quick deals. Well, you learn real quickly that Scott's is not for the financially timid. Bring you wallet, bring your mother's wallet, your lover's wallet and your children's college education funds. Very high in price on 80% of booths offering items for sale. Open sidewalk tent. Lots of great architectual pieces inside and high prices to go with it. Still, if you are looking to add to your home and you have the means, you will find lots to choose from. Loved the cast iron work in this open booth. One of several entrances and you can see it is packed with booth after booth after booth. Lots of fine art, jewelry, decortive and architectual booths. Scott's reminds me of The Festival in Boca Rotan, FL which is a huge warehouse taken over and broken down into small booths where private labels sellers have very low overhead and sell at great prices. Scott's setup was like that except the prices were steep. One of my favorite booths, no dealer there to assist you, marvelous items but obscene in price for everything. Example: small, white ceramic discs with black numerals on them were $128.00 each. WTF!!!! I never found a price on these lovely child's chair frames but I can only imagine what they were asking. Same booth with great little arms, hands and leg pieces. Everything was imported in from Europe and really lovely. Again, nothing priced. They also had lovely french journals and manuscripts, nothing priced. People walked in and walked out when they saw the price of the ceramic discs for fear that it would be the price of a mortage on a small hand. If you are looking for high Victorian pieces, Scott's offers it. These hand carved Victorian shelves were gorgeous. Couldn't resist the hats..I adore wearing vintage. This dealer also had fantastic new rhinestone pieces that were to die for. Her prices were reasonable and what you would find at an antique show or shop. Scott's is so big that I had to take a bus to the south pavilion to find my friend's space. The south pavilion has more antique booths in it and my friend's space is in the center of the pavilion...perfect for foot traffic. Susan always finds such pretty vintage wicker and wire items and as always, her space is so warm and pretty to look at. 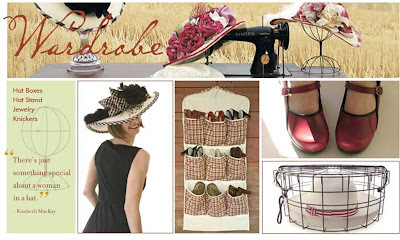 From large pieces to the small, My Vintage Heart always manages to display with a lovely theme. Pretty vintage pastel flower pots in a child's wheel barrow are just charming. Susan's black furniture pieces are displayed like a personal parlour. Lovely as always. This was a booth on the other side of My Vintage Heart and it had marvelous garden pieces. Fell in love with this large portrait of a soldlier next to antique cooking copper. Lots of booths offer upholstery and fabrics so if you have a favorite piece that needs a new look, Scott's is a great source. Lots of white on white and burlap on French pieces. I must admit that although I like the look of burlap on elegant frames, I don't think it is practical for use. Nothing worse then sitting on scratchy fabrics and I believe the fad will run it's course pretty quickly. I rather like the burlap pillows with lettering and verse as decorative pieces as these can be changed out so much easier. Although, I do love this chair deconstructed. This was to be redone, but I really like it the way it is. So many great ideas can be found. This booth dealer pasted lots of vintage newspapers, book plates and other emphrama to create a booth screen to separate themselves from their neighbor's items. I loved the look. I was in a booth full of lace and linens (a personal weakness of mine) and found a few lovely things. Ginny's Vintage Linens had mother and daughter working the booth and of course, Chy Chy. Hi, my name is Chy Chy. Short for Cheyenne. I'm very sweet and I thank you for buying lace from my booth. How could I resist such a sweet face. Chy Chy sold me a lovely battenburg collar, a pair of blue/white work and an exquisite Italian engraved print (pics following Scotts visit). 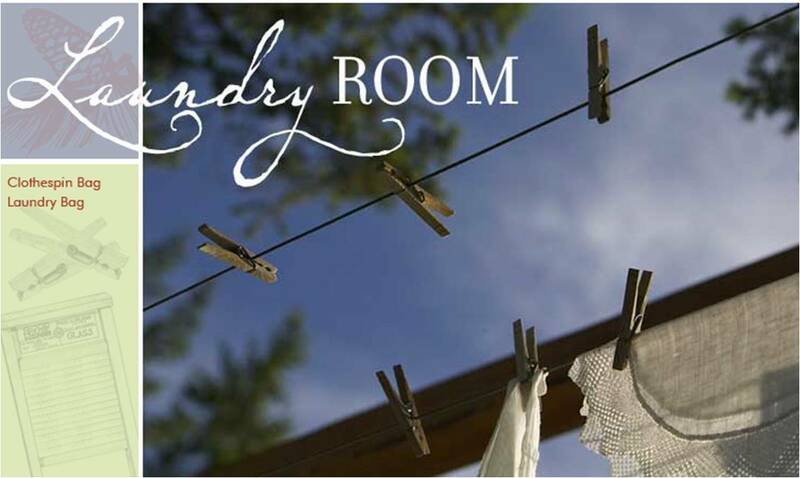 Great prices at this booth and beautiful lace was found at Ginny's Vintage Linens. Lots of imports from Asia but you can't beat the fun colors and large groupings of buckets, stools and other items. Love the faces on these sweet dolls. Now for the few treasures I brought back with me. Chy Chy's mother sold these to me. Lovely blue stitching on fine white linen. Pretty vintage Asian pieces. Stitching is very fine and reminscent of English blackwork. Incredible battenburg collar. Lovely handwork. Still need to starch and press. Will look lovely with an antique cameo. Marvelous board game...The Glad Game from Pollyana. Dated 1919, I will frame this before I take it into my booth. I loved the Pollyana books and Disney movie with Haley Mills. Many people laugh at its simplicity and message of kindness to one another. I think we need to revisit the Glad Game often these days. Couldn't resist this huge glass vase. Will fill with faux sparrow eggs and tiny white lights. And my favorite piece from Chy Chy. This lovely Italian engraved print. Dated 1780 in antique frame with original blown glass. Perfect.